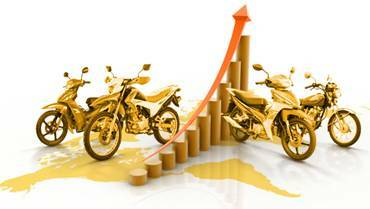 From January to April, the total production and sales of Chinese motorcycle industry kept a stable decline. In the first four months, industry-wide output and sales of motorcycles fell by 7.82% and 8.18% year on year respectively to 6,252,100 and 6,269,300 units. Industry experts believe that the reason for this downward tendency is partly because more than 90% of the domestic motorcycles are aimed for rural markets. But nowadays many consumers from the countryside prefer cars to motorcycles due to an increase of their income level and the rapid development of China’s automobile industry. On the other hand, the fast growth of electric bikes and the banning of motorcycles in urban centers also have negative effects on the industry. Many local manufacturers have always attached great importance to overseas markets, and the export volume is around half of the domestic sales while this number keeps increasing year by year with some fluctuation. Besides, Asia, Africa and Latin America are three major motorcycle export destinations capturing almost 88 percent of all exports. Li Bin, Secretary General of China Association of Motorcycle Manufacturers, pointed out that the reasons for export declining were due to slow recovery of global economy, regional instability and insufficiency of external demand. More importantly, price used to be the major competitive advantage of domestic motorcycles; however, as the increase of labor and production costs, we need to transfer from price competition to quality and differentiation competition. Thus, for the current phase of motorcycle manufacturing, future investments shall be concentrated on research and development, improving products’ added value then further promoting industrial transformation and upgrading via product and service innovations. Although the above report indicates that there is a declining trend in the total production and sales of Chinese motorcycle industry, Haojin Motorcycle was ranked one of the top 10 enterprises of motorcycle exports in the first half of 2015, according to the statistics analysis by China Association of Automobile Manufacturers. This is all about devotion as well as extremely high responsibility to our loyal customers. 2015 is going to be a year of major transition for the Chinese motorcycle industry; however, we strongly believe that we could further boost quality and reliability to rival other competitors.